Contrary to popular belief, eSports is not a new concept invented by millennials. It has been around for much longer, ever since video games became mainstream in the 1980s. The first eSports tournament was held in 1980 when 10,000 participants competed by playing Space Invaders, which was the most popular game of the time. However, the most popular and memorable tournament ever was probably the Quake Game tournament held in 1997, when the winner won the 1987 Ferrari 328 GTS. Most recently, in 2018, the International 2018 DOTA 2 Championships had a prize pool that totaled more than $25.5 million. This tells us that eSports have come a long way since their humble beginnings, and are recognized today by both sponsors and the general public. 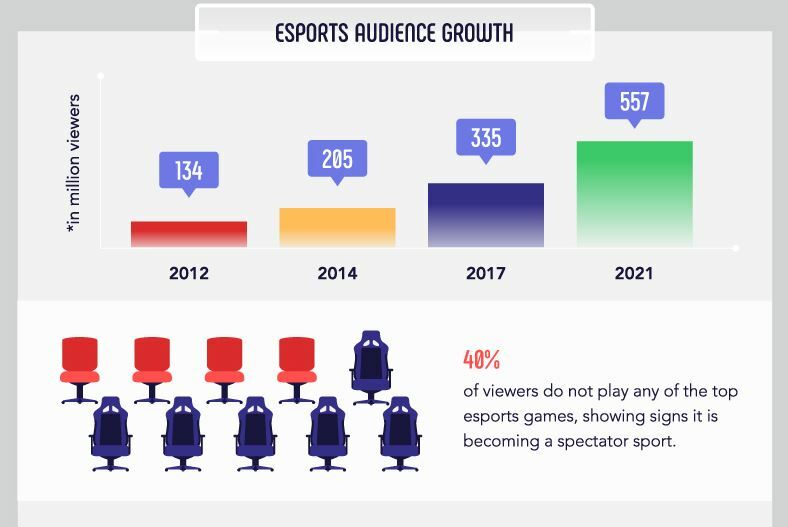 According to it, the eSports audience growth is quite staggering. In 2012, it had 134 million viewers, in 2014 it was 205 million, while in 2017 the number was 335 million. The future looks bright, as it is predicted that by 2021, eSports will have around 557 million viewers. In the beginning, the majority of the audience were actual gamers who came to pick up new skills, find inspiration and watch their online idols play. 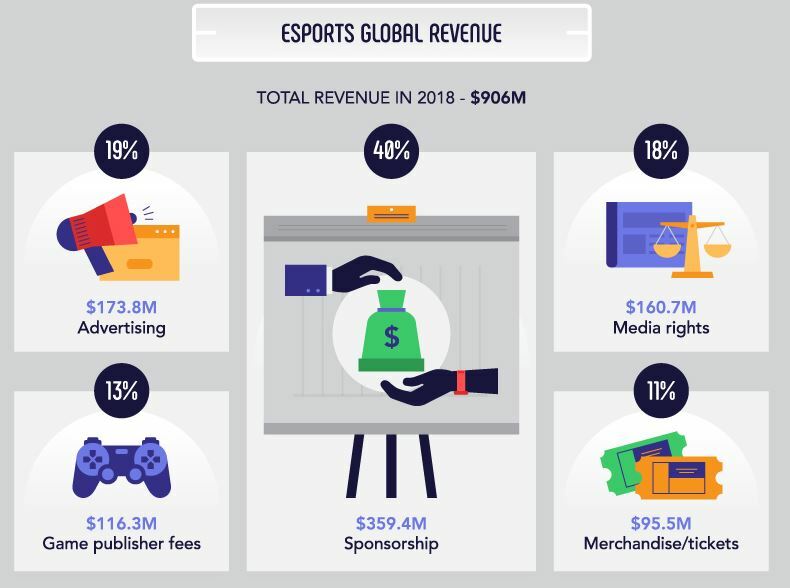 However, the situation is different now since it is estimated that 40% of viewers do not play any of the most popular eSports games – they are watching tournaments just for the beauty of the sport. When it comes to the demographics of the viewers, the data shown in the infographic does not surprise us. The majority of the viewers (62%) are males. Moreover, the largest part of the spectators, around 56%, are aged 21–35. 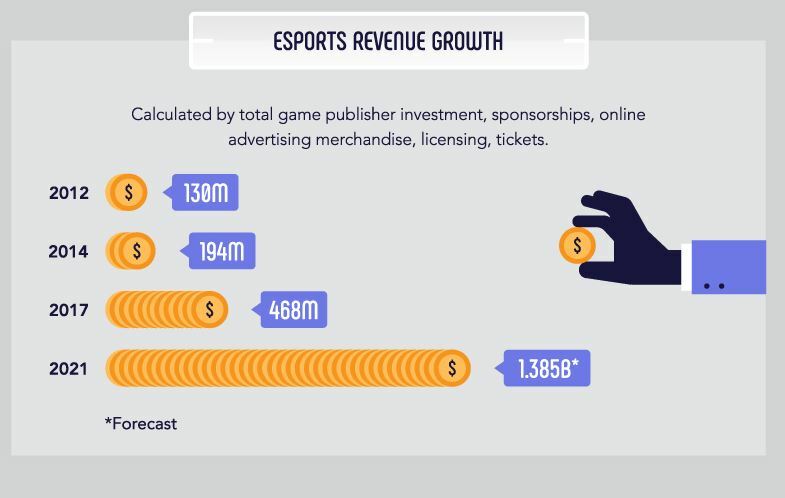 The numbers regarding the position of eSports in today’s world are really interesting. The infographic goes into more details, so if you wish to learn more, take a look below.